My mom passed on a box of books, with several being by Liane Moriarty. Lucky me!! So the sixth book I've read this year is another by this newly discovered (for me) author. I am (as usual) being a bit flexible with my categories and listing What Alice Forgot as 'a book set in two different time periods.' While I suppose it's a stretch to say it's set in two different time periods, What Alice Forgot is about Alice rediscovering her life after a bump to the head causes her to think it's ten years earlier. Imagine if you suddenly felt the same about things as you did ten years ago, without knowing any of the intervening facts and events. This is where Alice found herself, in the middle of a messy divorce from a man she still thinks she's desperately in love with, and fighting over custody of three kids she doesn't fully remember or recognize yet. 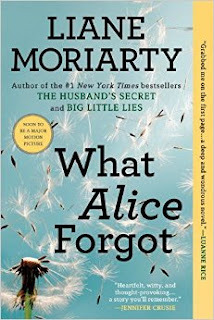 At this point, I would recommend any of Liane Moriarty's books. I would recommend a break in between them, though, as the characters are starting to blend together in my head, and none of the books are actually related or have any overlap of characters. Luckily I've already finished another book, and am partway through yet another, that are by different authors. But I am looking forward to getting back to the box and some more of this delightful author. What author have you been lucky enough to pick up, and wanted to keep reading everything they've written? This book sounds really interesting. I can't imagine suddenly being 10 years ago in my mind and yet being in the now. I love "Who Moved My Cheese", can't get enough of this book!